As LGB&T Champion for the Civil Service, I want to celebrate some of the terrific work being undertaken within government organisations to ensure the Civil Service is an exemplary inclusive employer. Earlier this month, Stonewall published their annual Top 100 Employers List, showcasing and benchmarking the best employers for lesbian, gay and bisexual staff. I was pleased to see the Civil Service well represented in the Top 100. HMRC is recognised, as are the Department of Health, the Crown Prosecution Service, the Office for National Statistics and MI5, while the Welsh Government entered the Top 100 for the first time. Particular mention is also given to the Home Office. It has been identified as part of an elite group of ‘star performers’ for its consistency on this agenda, having repeatedly demonstrated their commitment to creating an inclusive workplace by achieving a top 10 ranking in the Stonewall Index at least 3 times in the last 5 years. 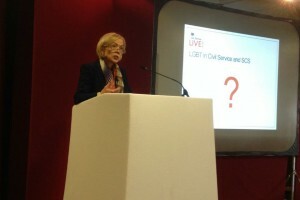 The Home Office will now work with Civil Service Learning to implement a Mentoring and Coaching Scheme targeted at lesbian, gay, bisexual and trans staff across the Civil Service, with the Home Office acting as a centre of excellence. In September we published the Talent Action Plan which details our commitment to value all staff, irrespective of who they are or of any visible or non-visible differences. It focused primarily on gender barriers to career progression, on which we are making headway. But to inform our next steps, 3 further reports were commissioned to examine the barriers for civil servants who declare disabilities, are from a minority ethnic background, or who are lesbian, gay, bisexual or trans. We will be publishing the findings of these reports in March, alongside a refreshed Talent Action Plan with further actions to implement in response to the reports. I’m immensely proud to be part of an organisation that gives serious consideration to, and acts upon, the needs of all talented staff. I agree wholeheartedly with Lord Browne, former Government Lead Non-Executive, who in his book ‘The Glass Closet - Why Coming Out is Good Business’ makes the case that staff are both happier and more productive when they can be themselves at work - expending their energy on doing their job rather than on trying to adapt or hide elements of themselves in order to fit in. The Civil Service can, and should, be the kind of inclusive employer that makes this possible, and we are learning from the best-performing organisations around the world about how to achieve this. 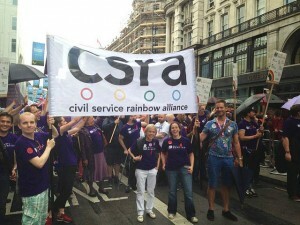 I also want to make you aware of some of the great work by CSRA (the UK-wide network for lesbian, gay and bisexual civil servants). They have published an inspiring list of role models. This is an excellent way to give people confidence in being open about their sexual orientation at work. Positive attitudes towards difference must be the default position across the Civil Service, and I would like us all to build on this work and encourage more inspirational role models and allies at every level of the organisation to come forward. Similarly, I’d like to promote the work of a:gender, our Civil Service network group for staff who have changed or need permanently to change their perceived gender, or who identify as intersex. I found their guide for staff and managers really useful. Finally, thank you to all those Civil Service organisations who took part in the Stonewall Index. The competition is tough and the key to success is persistence and continuous improvement - both things that the Civil Service values. There is still progress to be made, but I hope, like me, you feel positive and confident that we will see even more Civil Service organisations named and celebrated in 2016. Please do get involved and take part in the conversation around these issues on the Civil Service Talent Action Plan Yammer Group. I am very surprised at this, and wonder where exactly Stonewall is going to find its facts and evidence. The Service I have been working in for the last few years, and particularly recently, is one that is becoming increasingly focused on bullying, harrassment and intolerance of anyone who shows the slighest inclination to express an opinion, individulaity or initiative. Barry, I'm afraid I wasn't quite clear about the point you raise. Are you concerned that the Civil Service is still not doing enough to tackle bullying, harassment and intolerance of LGBT employees? Perhaps you could expand? Hi Michael, from my experience and from what I have witnessed the Service is riddled with institutionalised bullying and it has become worse in recent years; not just speaking as a gay man but also in support of all colleagues who face this awful reality. Unfortunately the Service seems to like and try to cover the reality by trumpeting meaningless surveys. Someone else finally said it! Thankyou Barry! I am in complete agreement with you. Plenty of subliminal bullies too here in the Civil Service. It's a shame, then, that various department continue to host events in a central London location well-known for hosting "gay conversion therapy" conferences. Even if said venue was free, it sends completely the wrong message. I believe that the Civil Service has made significant progress in terms of being a more diverse organisation but it has to be acknowledged that unconcious bias towards staff in terms of their gender, sexual orientation and ethnicity still does exist. It really is for everyone to make that extra effort to improve awareness and understanding and to press for real change. I have to say that I was impressed with the role models live document and I am sure that this will help increase understanding. Things like the Talent Action Plan make my blood boil. As a gay man, I would want to get on in my department because I'm good, not because I've signed up to some 'plan' designed to tick boxes on someone's PMR. It is just patronising rubbish. Maybe Alex, but if this is what it takes to break the glass ceiling that many face, then so be it. I don't believe that there is a 'glass ceiling'. It's just a myth perpetuated to create jobs & posts in the diversity 'industry'. I agree with Alex. I believe that they do it so that they can show that they include people from the LGBT community. Even the BAME, is the same. It's just for statistics and though i'm not part of either community, i'd like to think that if i was, i was getting picked based on my talents and not a scheme designed to cover up the real unconscious bias still present. I thought this article was well written, forward thinking and informative. Good to see something of this nature published. Personally speaking, as a very open gay man in DFT, I have to say that I've never experienced or been told of any departmental institutionalised bullying or harassment regarding LGBT issues. If anyone does have problems in this respect, they must report it and speak up without fear or compromise. That's why we have Diversity and HR to deal with and monitor these things should they occur.